Colvin & Moggridge » Caribbean-Asian fusion: Lazy Lizard, Jumby Bay Island, Antigua. This private Caribbean villa with its constellation of guest cottages and ornamental pavilions is being built to a Thai inspired architectural theme. 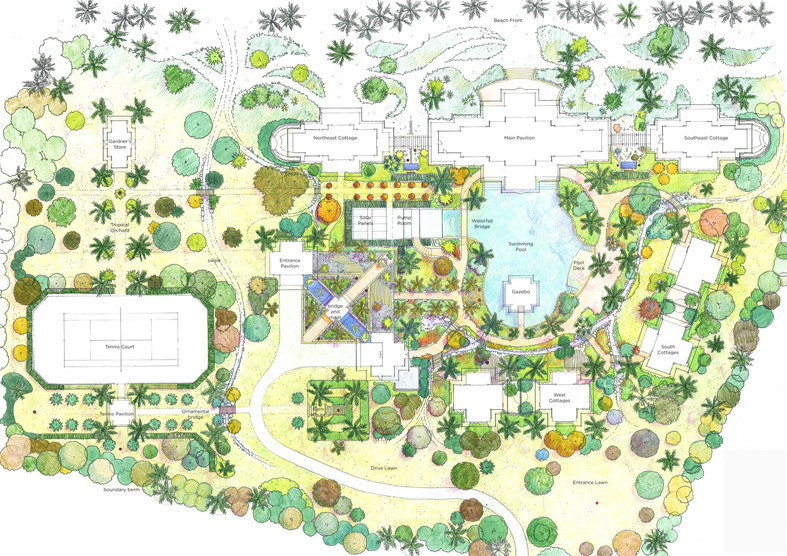 Our masterplan for the estate creates a wonderfully unique setting by drawing on both Caribbean and Asian landscape style. A moated entrance bridge provides the gateway transition from Caribbean to Asian style and leads to a 6m Buddha centrepiece. 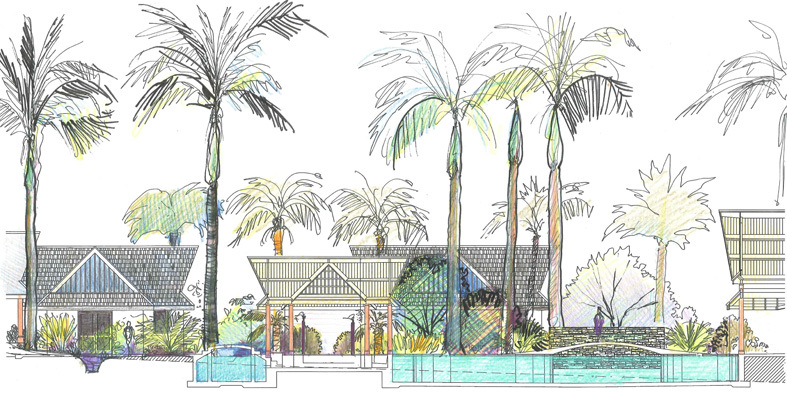 The drive approaches and boundaries are planted with pastel-coloured Caribbean shrubbery, flowering trees and palms; which contrast beautifully with the richly-toned exotic, tropical Asian-style gardens laid out around the feature swimming pool, waterfall bridge and gazebo. This fusion of styles is enhanced by imaginative use of surface water channels or ‘swales’ that are threaded through the landscape. Rock and pebble-lined swales with sinuous, lush planting encircle cottage gardens and are crossed by a variety of ornamental bridges that form focal points to picturesque landscape prospects along the paths. Artfully designed palm and avenue-framed vistas give structure to the grounds, most notably linking the tropical orchard, tennis pavilion and palm mount along the drive. Inside this outer framework, individually designed pavilion and cottage gardens, detailed with artworks, stone lanterns and elegant pots, include Asian-themed shower courtyards and pergola pool gardens with ornamental screens. Beachfront design contrasts dramatically with the rich Asian-style core in a seamless transition through the principal pavilions. Swirling drifts of ground cover frame sandy paths and seating areas amongst informally arranged palms, native trees and shrubs, ensuring a natural feel to sea views.